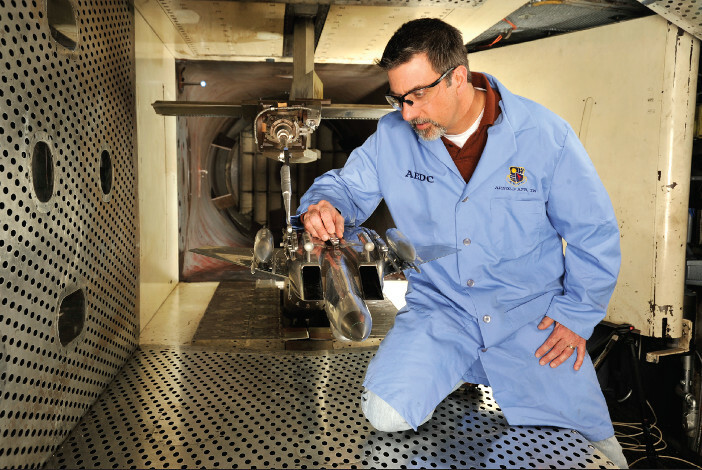 Arnold Engineering Development Complex (AEDC) in Tennessee is celebrating 50 years of service for its 4T wind tunnel, which has been used for the development of new weapons and stores used on high-speed jet aircraft. 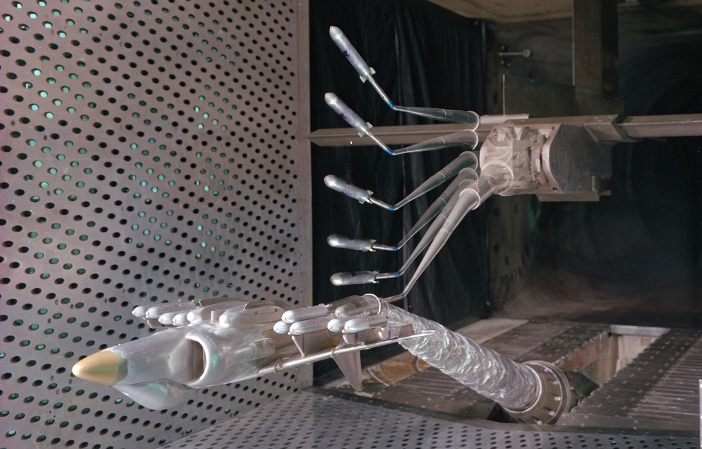 Development of the The 4ft (1.2m) transonic wind tunnel at the AEDC dates back to the early 1960s, when the US Air Force recognized that with the advent of the jet age, the development of new weapons that could be safely separated from aircraft and accurately strike the intended targets was critical. In the early 1960s AEDC had two tunnels within the speed range of Mach 0.3 to 1.5 – a 1-foot transonic wind tunnel and a 16-foot transonic wind tunnel. Both were regularly fully booked for use. By 1966 the design of 4T had been finalized and construction had started on the US$1,150,000 tunnel. The wind tunnel took 15 months to build and was completed in November 1967. The 4ft transonic wind tunnel was described in technical reports published at the time as a “closed-loop, continuous flow, variable-density tunnel.” The continuous-flow aspect of 4T allowed the tunnel to have greater run times than blowdown tunnels. An individual compressor system was not installed for 4T to save money. Instead, the new wind tunnel was connected to the existing Plenum Evacuation System compressors in the Propulsion Wind Tunnel (PWT) facility. The tunnel was the first to use a Captive Trajectory System (CTS), a six degrees-of-freedom system that allowed for the simulation and study of weapon and store separations. It also featured variable porosity walls to allowed operators to control wave attenuation and blockage effects on a test article. The first time 4T was used on January 29, 1968, it was for the US Air Force Armament Laboratory to test of a Hard Structure Munition missile model at transonic speeds. A few months later the first store separation test was conducted – to determine the dynamic and static stability characteristics of the AGM-12E missile and to investigate the separation characteristics of the missile from the inboard wing pylons of the F-105 aircraft. The testing determined that the store would separate from the inboard pylon without jeopardizing the aircraft. After its first decade of operation, 4T was being credited with saving millions of dollars and eliminating the need for thousands of hours of flight testing in the development of payloads for military aircraft. By 1978 it had been used by test programs for the Air Force, Army, Navy and NASA. These tests supported the development of stores and certified their use with numerous aircraft, including the F-105, F-4, A-7 and A-10. The 4ft wind tunnel has continued to evolve over the years. Nozzle blocks were added in 1971, allowing 4T to exceed its original maximum Mach number of 1.35 up to Mach 2.0. In April1989 a flexible nozzle was installed to enable Mach numbers greater than 2.0. As well as speed increases, a grid technique for analyzing store separation was developed in the early 1980s which replaced the laborious captive trajectory mode method. With the grid technique, the weapons system was placed under the parent aircraft in a grid arrangement. Data was then collected on the store at different orientations in the space beneath the aircraft. 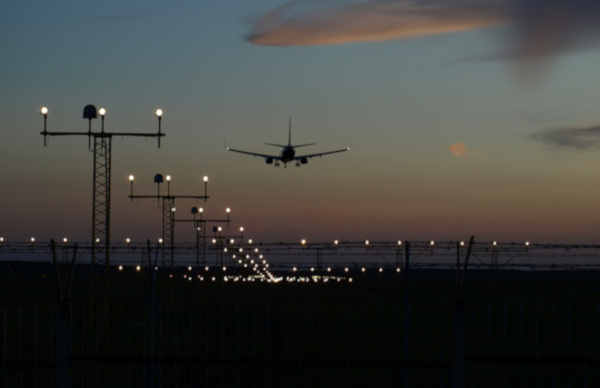 In the late 1980s, the Computational Fluid Dynamics team at Arnold developed a method of simulating stores released from aircraft at high transonic speeds. At around the same time, AEDC brought a store separation graphics analysis program. The upgrades allowed engineers to complete wireframe models of test articles and see a 3D store trajectory display within moments of a test. According to AEDC, the demand for 4T has been increasing since 2012 and is expected to remain strong for the foreseeable future. 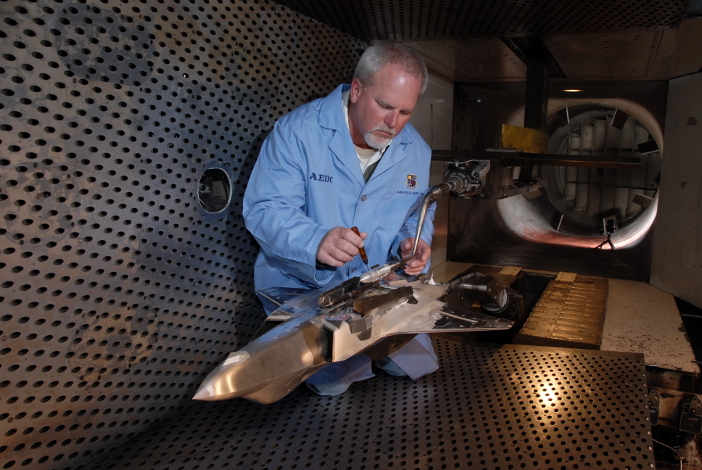 The wind tunnel is expected to continue to be used in the development of hypersonics. Although operations at the hypersonic level cannot be conducted within 4T, the tunnel provides groundwork before a test article is moved to a facility with a higher Mach capability, such as the AEDC Von Kármán Gas Dynamics Facility. “4T will play a role in the hypersonics surge, even though the speed regime is not what you would consider hypersonic, because the tunnel is foundational to that work,” said Lt. Col. David Hoffman, director of the Flight Systems CTF. Wind Tunnel 4T has received additional upgrades through the US Air Force Test Investment Planning and Programming (TIPP) program. The facility was shut down for around 18 months in 2013 for modernization work. During this time, the CTS mechanical and control systems were upgraded to increase position accuracy. System load capacity was also increased by around 40%, enabling 4T to accommodate larger models. The data acquisition system for 4T was also updated through TIPP to one which allows for time stamping at the point of data acquisition, as well as higher data acquisition and processing rates. 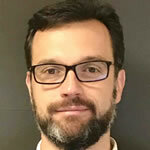 Flight Systems CTF Technical Advisor Scott Meredith said efforts have recently been made to make analytics part of the deliverables provided to test customers. Analysts in the test facility provide real-time data analysis and have developed and use tools to help customers make decisions to optimize tests. 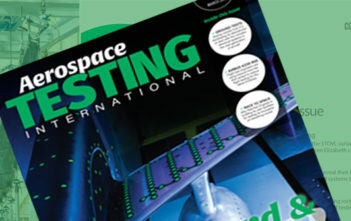 Those in the Flight Systems CTF agree that a half-century after its first test 4T continues to fill a much-needed niche in medium-scale transonic and supersonic testing. This article was originally published by the AEDC.